Over the years there is one request that comes up often while out visiting the cemetery… Are there any maps of the area to help them get around? Well… the long wait is over! We now have a collection of detailed trail maps that have been created using over 1200 GPS way-points, geospatial data and all other kinds of technical jargon. It took a long time to compile the information and as anyone who visits the area often knows, some things change and others stay the same. So it can be a challenge to keep up on a new foot path that’s been created, or finding new areas that need to be uncovered due to all of the vegetation. There are times that a path just disappears from lack of use. How do we keep up with it all with such busy lives? Spending a few dollars should do the trick for most people. Especially considering how long it takes to map everything out and the various costs involved with repeat visits and software. 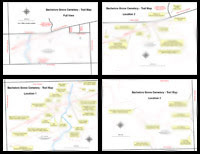 So if you have been one of the many visitors that has been craving a detailed map of the area around Bachelors Grove cemetery now is the time to head on over to the Trail Map page and grab yourself a copy. You should be pleased with the results and you can expect more additions and changes as time permits. The updates may become yearly considering the amount of labor involved. There are plans for different types of maps based on the subject matter and we’ll all just have to wait and see what happens. You should be pleasantly surprised if all goes as planned. As always, if you feel you have anything to add please feel free to let us know!